MÜNSTER - [Map of Poland] Brieve description du royaume de Poloigne. MÜNSTER, S - [Map of Poland] Brieve description du royaume de Poloigne. Title : [Map of Poland] Brieve description du royaume de Poloigne.. Size : 3.1 x 5.3 inches. / 8.0 x 13.5 cm. 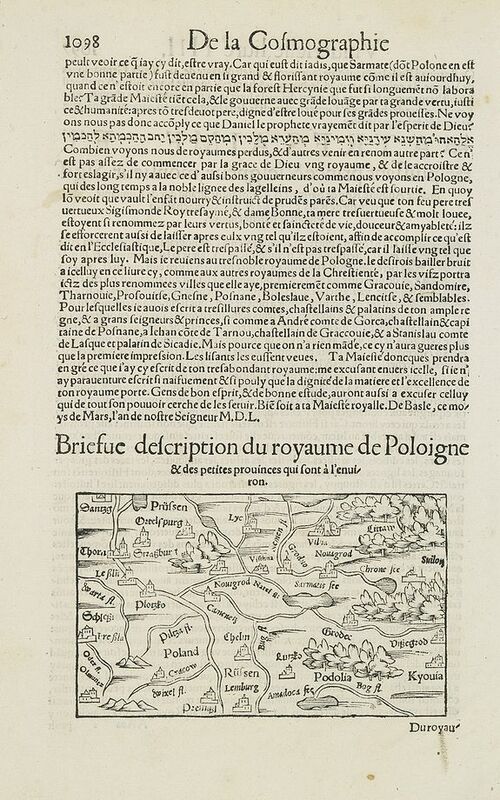 Description :Early map of Poland, surrounded on two sides with a brief description of Poland "Brieve description du royaume de Poloigne". Taken from a French edition of Sebastian Münster's encyclopedic work, the "Cosmographia Universalis". The Cosmographia by Sebastian Münster from 1544 is the earliest German description of the world. It had numerous editions in different languages including Latin, French (translated by François de Belleforest), Italian, English, and even Czech. The last German edition was published in 1628, long after his death. The Cosmographia was one of the most successful and popular books of the 16th century. It passed through 24 editions in 100 years. This success was due to the fascinating woodcuts (some by Hans Holbein the Younger, Urs Graf, Hans Rudolph Manuel Deutsch, and David Kandel). It was most important in reviving geography in 16th century Europe. Condition : Wood block print (80x135mm.) with letter press, in very good condition.